Is there a part number or rating printed on the current vacuum pump, which i assume is a venturi type? Is there also a vacuum reservoir, pressure gauge, check valve etc? ie. could the venturi simply be swapped out with a larger one? Does a pick and place really need a large volume of vacuum? And in this vacuum flow test what was the pressure and CFM rating of the compressor you used to power the venturi? It is not venturi type. ah, that's weird, why does QiHE specify such a large air supply is needed? Is it a small electric aquarium style pump? I think this forum is at mixed causes once again. The discussion you are referring to is with regard the TVM802 model - which I understand does not require an external supply. I assume you are in fact referring to the TVM920 model [which does]. so all the vacuum pump talk was about the older machine and not TVM920? Yes - I believe so. This forum knows of only one 920 machine 'in the wild' so far, and our is on its way this coming Monday. Harry owns a TVM802 machine. two 920's on its way to Canada, great ! Lets see if the 920 uses a venturi type pump or the tvm820's aquarium style pump. I am very curious to know how strongly the parts adhere on the nozzles. The other thing I like to know is how easy or hard it is to mount a board in the TVM920. With the 802 its very easy, this is one thing I missed with the 920 (from what I have seen in the few videos). Your video shows a machine with cut tape feeders and loose component bin feeders. Are these feeders part of machine frame or are they removable? If removable are they part of machine offering or did You purchase them separately? If bought separately, where from and how much did they cost? it if other feeders are required. The cut tape feeders are most important, there are so many parts I purchase in small quantities only. The loose part bins are mainly for microcontrollers and other bigger parts. Last week I did 25 boards with 58 different components, the left and back stack of the 802 was fully equipped and the other parts in the cut tape feeders. Lets see how the 920 can handle these kind of things. I was very close to purchase a 920. What makes me unsure is the housing, this would be the first thing to be removed, there are too many things to do in the machine and the housing is just in the way. The other thing is the PCB-holder, or the not existing pcb holder. This is very well done with the 802 and I miss it in the 920. I too am looking for fixed feeders for my machine. I made some cut tape feeders from a 6 mm thick phenolic board. The kind of material switch boards are mounted on. I make milled printed circuit boards and unfortunately the milling machine can not handle aluminium ( it runs an Alfred Jaeger 100KRPM spindle). The feeders worked out OK... but it turns out double sided tape on an aluminum plate is better at handling paper tape which has been rolled up. Rolled up tape tends to buckle upwards unless the edges are held down along the entire length of the tape. Double sided adhesive tape therefore performs better in this regard. and plastic tape is even worse. If the cover tape is remove just touch it gently and all parts will jump in all directions. 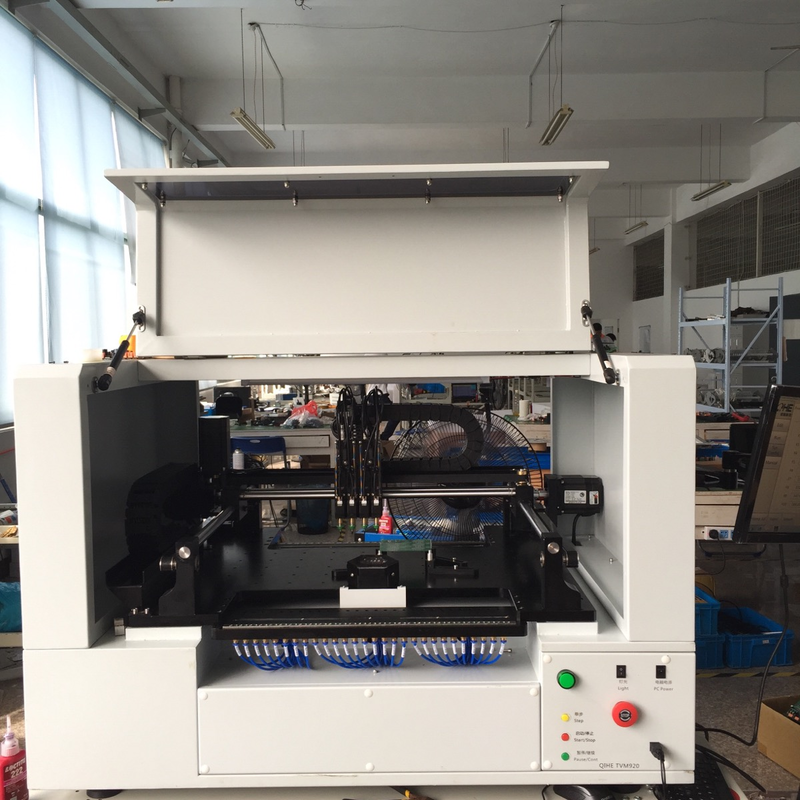 QiHE has sent me pix as they assemble and test my machine, they said it should ship this week. QiHE said it will ship today... these images are boring so I will just link them. I also got their 'high precision' stencil printer and T960 oven to try out. edit: they want $336 more in shipping and shipping will be later next week due to another long holiday. Anyone receive already a machine ? Things goes out of planes ? I dont want to push You, just Im very courious. In next days I would have to arrange the payment for mine, and your experience could influence a lot. If You have few "free" minutes could You share some impresion/images about Your machine ? I wrote a rather detailed response, then captured some images, and proceeded to delete what I had written. Dumb! I am very impressed by the build quality. So far, all that we have had time to do is unpack the shipment and check the contents. It certainly looks like a very well build and finished machine and at this point, I would have no hesitation in recommending this to anyone considering it. 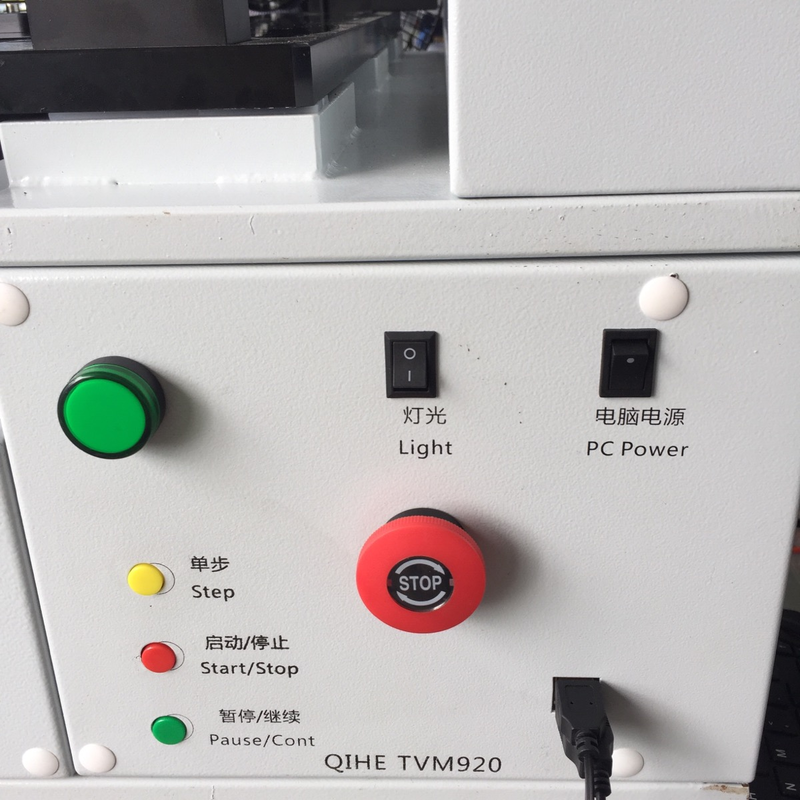 This is a substantial machine and it appears that QiHe have learned a lot in their years of manufacturing the smaller versions of the PnP machines. It certainly appears 'fit for purpose'. I will provide more information as we progress to set-up. For now, it remains my opinion that it is the best machine I am aware of in this sector of the marketplace. I can recommend that you contact a salesperson called Daisy who was incredibly helpful and knowledgeable during our pre-sales process. Please mention my name - 'Peter from Melbourne Australia' and that I recommended QiHe and to speak with her. Though not strictly part of this 920 forum page, I thought I'd include some basic information about the Reflow Oven we purchased to compliment the TVM920. It is from a company called Torch based in Beijing. The heating design is a combination of dark IR [pre-soak] and dispersed Convection [reflow] and, from memory, it has about 12 controllable zones. My comments regarding initial reaction, build, and unpacking apply equally to this oven as they did to the TVM920 [which I'm very happy to be able to say]. The contact at Torch has been a person called Sara, and I dealt with her throughout the pre-sales process. Her English is perhaps not as 'deep' as Daisy's [from QiHe] but we managed to get the order completed. This item too is no toy, and is very solid in construction, and certainly appears 'fit for purpose'. Again, please mention my name - 'Peter from Melbourne Australia' when and if you contact her. Any pics with human for scale? Please continue with updates on next steps, Im really courious how it works all together. 4) provide a sufficiently large user-base so that 'adaptation' could potentially happen for things such as an 'independent SW Application' [or preferably adopt OpenPnP and it's 'vision' counterpart]. Having made this last point, I truly believe that QiHe will continue to listen to its users and respond in tempo - a hugely great benefit for any potential buyer. So, though I have little, to no, interest in becoming a distributor, I would definitely like to promote this Manufacturer and Machine combination if it meets the expectations I currently have for it. In this regard I think my direction and goals are similar to many others. The ONE THING that made the difference and my decision easy [for me at least] is it's use of commercial-grade, reliable and easily swap-able component feeders. As you may already know, it uses the Yamaha CL type feeders which have been the backbone of many a PnP machine throughout the world for a long time now. They are pneumatic, so cheap to produce and maintain than electric feeders - the major downside being max feed rate is slower [but still plenty for most requirements. So ... let's build the numbers guys! This is a relatively expensive machine [from a hobbyist's point of view], and a very inexpensive machine from a CM's point of view, but I believe it is the sort of solution that is perfect for someone looking to accommodate up to 80+ diff components per load/project - [56x 8mm feeders + 30x tray-type], and needs to runs components no smaller than 0402. Intend to make custom 'trays' for each different project to handle the 1 & 2 off per board components, where the 56 feeders happen to 'run short'. BTW - though I've not yet tried it, my design thinking here is to laminate some approx 3mm thick non-EDS material with double-sided adhesive, laser-cut the pockets in it to suit, then adhere it to a 6mm Aluminium plate. 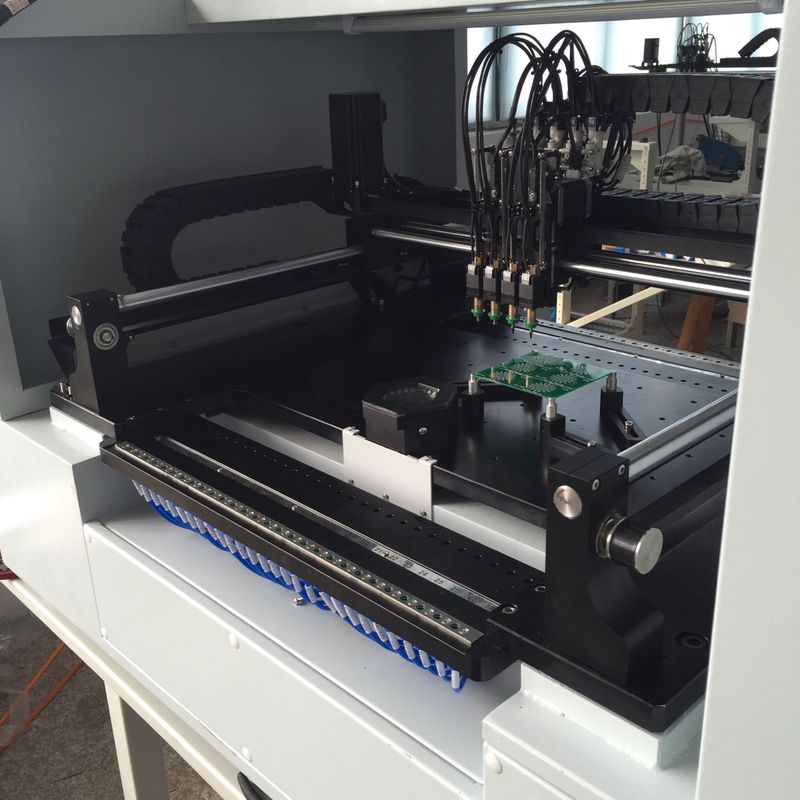 Quick, flexible and relatively easy solution to increase the max component-type count. Hope that we can build here the team of users and share experience and solution regarding our machines. Have a nice day and good luck to the machine !